Food is a blessing of God, which helps us to generate the energy required to live life in a proper way. It is the building block of our body and provides us with the essential nutrients. Food is vital for any individual and as we know good food ensures a good life. When a child is born, he or she does not start consuming food instantly. Instead, the mother's milk provides all the essential nutrients required by the child. But as the child grows in age, the body grows too and so does its requirements. Mother's milk alone cannot fulfill all the nutritional requirements of a growing body. For healthy growth and development of a child, solid food must also be introduced in his or her diet. 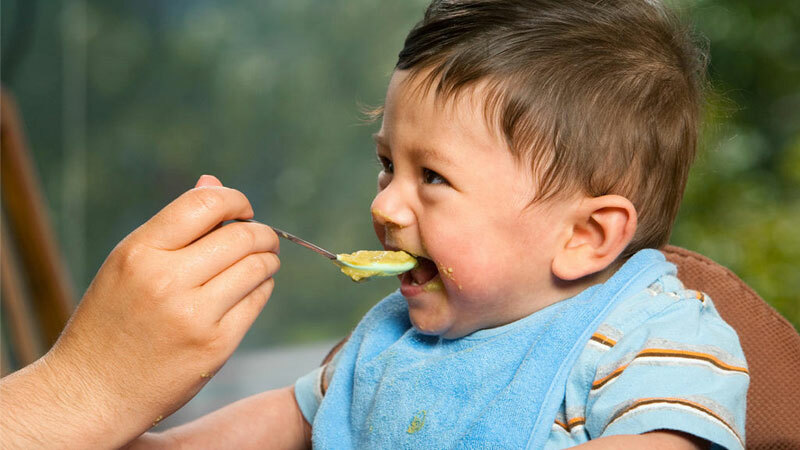 Initiation of including solid food into the child's diet is done when the child comes of that age. The first food intake is a moment of joy and celebration in the family of the child and is known as Annaprashan. The word Annaprashan is made up of two words, Anna and Prashan. Here, Anna refers to food and Prashan means the starting of the process. Hence, Annaprashan marks the beginning of solid food intake by a child. Annaprashan is one of the 16 Hindu Sanskars. It is also known as Annaprasana or Annaprasanam. It is known by the name ‘Bhatkhulai’ in Garhwal Hills. In Bengal, it is termed as 'Mukhe Bhaat’ and in Kerala, it is called 'Choroonu’. It is considered to be an auspicious ceremony which marks the initiation of a new phase in the life of the child. Why is Annaprashan ceremony considered to be important? It is believed that during the gestation period (the period during which the baby is inside the mother's womb), the baby might swallow some things which are considered to be impure. When Annaprashan is done, it cleanses these elements from the body of the child and purifies him/her. Also, the rituals performed during the Annaprashan ceremony helps to discover the bent of mind that the child possesses. Because Annaprashan is an event during which friends and relatives bless the child and prayers are held, it is beneficial for the future of the child. Annaprashan ensures longevity and healthy growth and development of the child. Annaprashan Muhurat refers to the auspicious time-slots during which performing the Annaprashan ceremony will pan out to be beneficial for the child. The purpose of calculating Annaprashan Muhurat is to find out the appropriate time for performing the Annaprashan ceremony. Why is Annaprashan Muhurat needed? Annaprashan is an important event in the life of an individual. The word Anna, which literally translates into grain holds much more importance than we can comprehend. It is believed that we are and how we live is often determined by what we eat. There are instances in history, which prove the importance of Anna. Because Anna or food is very important, the initiation of food in a child's life is a crucial event, which should be done at the right time. To get the maximized benefits of Annaprashan, one should strictly follow the Annaprashan Muhurat. By doing so, one can keep problems and bad omen at an arm's length. How Is Annaprashan Muhurat Calculated? Annaprashan Muhurat is calculated by keeping in mind the position of celestial bodies in space and their position in the birth chart of the child for which Annaprashan has to be performed. The age of the child as well as gender play an important role in determining the Annaprashan Muhurat. Vaar: Vaar helps to know the days of the week which are favourable for doing Annaprashan. Tithi: Tithi lets us know the auspicious lunar dates for performing Annaprashan ceremony. Nakshatra: Nakshatra refers to the 27 constellations in the universe. The Nakshatra given in the Panchang help us to find out which Nakshatras needs to be selected for Annaprashan ceremony. Yoga: It determines which Yoga is good for performing Annaprashan. Karna: It is half of Tithi. Karna divides the Tithi into two equal halves. When & where should Annaprashan be performed? The Annaprashan ceremony of a child can be performed between 6 months to 12 months (1 year) of age. After 6 months of birth, teething of a child begins and his or her digestive tract strengthens. It is at this age that the best food should be consumed by him/her so that it can be converted into the energy that is required for a healthy growth and development (mental as well as physical) of a child. Annaprashan for girls should be done during the odd years, generally when the girl child is 7 or 9 months old. For boys, it is performed during even months of age. The 6th and 8th month are considered to be most favourable for a male child. However, in both the genders, it should be performed before the child turns one year old. As far as the location for performing the Annaprashan ceremony is considered, it can be performed at home or in a temple. In Kerala, it is performed at Guruvayur, which is a highly revered Hindu temple. There is no hard and fast rule about the location of performing Annaprashan. Some people want to make this event a memorable one, so they celebrate it on a large scale. They might organise a party or gathering at a convenient place as per their preference. How is Annaprashan ceremony performed? First of all, various Annaprashan Muhurats during which the ceremony can be performed are traced. The best Muhurat out of these Annaprashan Muhurat is selected for performing the ceremony. The baby should be bathed and dressed in clean clothes, preferably new. In general, parents dress their child in traditional clothing like dhoti-kurta for boys and Lehenga-choli for girls. The process starts with a Puja or Havan, which creates a holy environment and positive aura. Prayers are held for the health, well-being and longevity of the child. The child is seated comfortably before being feed. A family member feeds the first bite of food to the child. This food is also referred to as the Prasad. After the child consumes the first food, relatives and family members shower blessings upon him/her and wish him luck for future. Generally, an activity is performed to know the child's inclinations and interests. Symbolic objects are presented to the child, from which the child has to make a selection. Whatever item the child chooses reflects his bent of mind and areas of interest. Some common items that are extensively used for this process are books, jewelry pieces, pen, clay, food, etc. Books symbolise learning and thirst of knowledge. Jewelry or ornaments signify money mindedness. Clay is symbolic of property. Food signifies the child's love for eating. Because Annaprashan marks the beginning of solid food intake by the child, it should be kept in mind that the best food for the child is to be served during the ceremony. Generally, Kheer (boiled rice cooked in sweetened milk) is the first dish that is fed to a child. Some people also keep Payash in the menu. A tradition of feeding mashed rice with ghee or honey has also been observed. Well cooked Dal can also be served to the child. Spicy foods and oily foods can upset the tummy of your child and affect his/her health negatively. Hence, they should be avoided. If your child is allergic to certain food or food products, you should avoid them. Monday, Wednesday, Thursday and Friday are considered to be favourable for performing Annaprashan. Annaprashan should be done in the Shukla Paksha (waxing phase of the Moon). However, it can also be done during Pratipada, Tritiya, Panchami, Saptami and Dashami of the Krishna Paksha (waning phase of the Moon). The Ashtami and Navami of Navratri are also considered to be highly auspicious for conducting this ceremony. The birth Nakshatra of the child is generally avoided for performing Annaprashan ceremony. Annaprashan should not be performed during an eclipse. Annaprashan should not be done on Amavasya (no Moon day). Taurus, Gemini, Leo, Virgo, Libra, Sagittarius, Capricorn and Aquarius are considered to be the best Lagna for Annaprashan. What are the precautions to be taken during Annaprashan? Annaprashan should be avoided during Aries, Scorpio and Pisces Lagna. Annaprashan should preferably be performed during the waxing phase. Do not feed too much to the child, otherwise, indigestion may occur. Make sure that the food is freshly prepared in a hygienic manner. Avoid spicy and oily foods. Consult your paediatrician if you are confused about what should be on your child's platter when he/she takes the first bite of solid food. Hope you have got the answer to your questions. Best wishes from AstroSage.